Because ePortfolios are tied to the user Profiles and not a specific course, users can build an unlimited number of ePortfolios in which to collect and document their educational projects, submissions, experiences, and other work products. 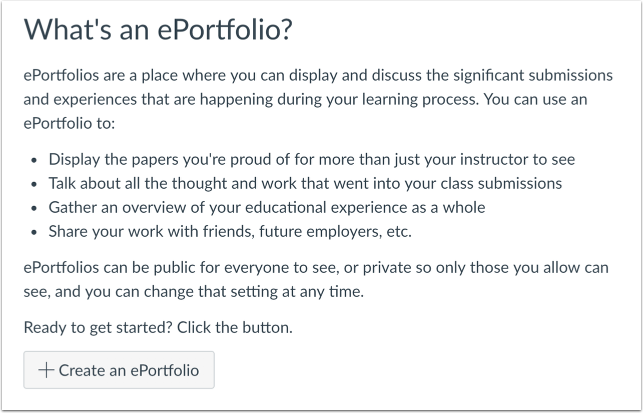 Users can keep ePortfolios private or share with other students, instructors, and/or future employers. In Canvas, ePortfolios remain active as long as the user is in the institution’s SIS and maintains a school login. Canvas also allows users to export ePortfolios to a zip file. ePortfolios can be set to allow private or public access. When would I use ePortfolios? Next Topic:What are External Apps (LTI Tools)? Table of Contents > Canvas Features > What are ePortfolios? Re: ePortfolios in the younger grades!